Danya Xena is a joyful, enthusiastic and high-energy Acrobat who will pull you in to her magical world of awesome. She believes Acro is about playing, learning, communicating, working together, having fun, and celebrating! Danya loves the communal aspect of the practice, together you co-create something greater than what you can accomplish on your own. She loves the thrill of assisting someone new to the practice connect with their power, as well as helping more experienced practitioners master new tricks. As a mid-weight acrobat she is both a base and a flyer, and as such, has a great understanding of both sides of the practice. 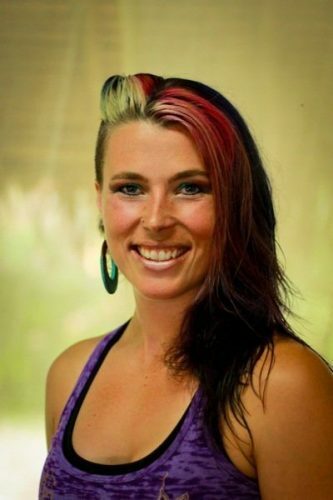 Danya teaches yoga and Acro and specializes in inversions, handstands and arm balancing. She brings to her teaching years of experience as a corporate health and wellness co-ordinator, group facilitator, presenter, life coach as well as her passion for social justice, and equality. Danya’s offerings include classes, private lessons, workshops, weekends and retreats. She is currently traveling all over the world sharing the joy of Acro with people everywhere. If you decide to practice with Danya, you are in for an incredibly fun experience. Awesomeness is guaranteed, and there is no doubt that she will unleash your inner super hero! Danya qualified as a Partner Acrobatics teacher in Thailand in 2013 and an Acro Revolution Teacher in Virginia in 2014.